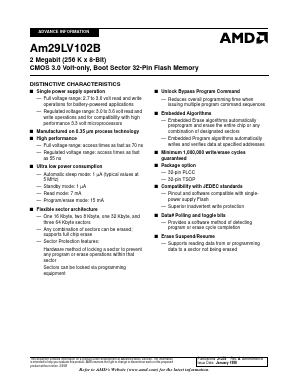 The Am29LV102B is a single power supply, 2 Mbit, 3.0 Volt-only Flash memory device organized as 262,144 bytes. The data appears on DQ0-DQ7. The device is available in 32-pin PLCC and 32-pin TSOP packages. All read, erase, and program operations are accomplished using only a single power supply. The device can also be programmed in standard EPROM programmers. S29AL016 16 Megabit (2 M x 8-Bit/1 M x 16-Bit) CMOS 3.0 Volt-only Boot Sector Flash Memory ãã¥ã¼ Spansion Inc.
EN29LV160C 16 Megabit (2048K x 8-bit / 1024K x 16-bit) Flash Memory Boot Sector Flash Memory, CMOS 3.0 Volt-only ãã¥ã¼ Eon Silicon Solution Inc.
AM29F160D 16 Megabit (2 M x 8-Bit/1 M x 16-Bit) CMOS 5.0 Volt-only, Boot Sector Flash Memory ãã¥ã¼ Spansion Inc.
EN29LV800 8 Megabit (1024K x 8-bit / 512K x 16-bit) Flash Memory Boot Sector Flash Memory ãã¥ã¼ Eon Silicon Solution Inc.
S29AL004D 4 Megabit (512 Kx 8-Bit/256 K x 16-Bit) CMOS 3.0 Volt-only Boot Sector Flash Memory ãã¥ã¼ Spansion Inc.